Solid Builder is the algorithm for building solids from set of faces. The given faces should be non-intersecting, i.e. all coinciding parts of the faces should be shared among them. Find all unclassified faces, i.e. faces outside of all created solids, make internal shells from them and put these shells into a warning. It is possible to avoid all internal shells in the resulting solids. For that it is necessary to use the method SetAvoidInternalShapes(true) of the base class. In this case the steps 5 and 6 will not be performed at all. 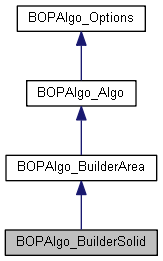 BOPAlgo_AlertSolidBuilderUnusedFaces in case there are some faces outside of created solids left. For classification purposes the algorithm builds the bounding boxes for all created solids. This method returns the data map of solid - box pairs. Performs the construction of the solids from the given faces. Classifies the created shells on the Holes and Growths. Creates the solids from the Growths shells. Puts the Hole shells into the closest Growths solids. Classifies the unused faces relatively the created solids. Puts the classified faces into the closest solids as internal shells. Warns the user about unclassified faces if any. myLoopsInternal - The shells created from unused faces. that are alone but given twice with different orientation. These faces will be put into the map myShapesToAvoid and will be avoided in shells construction, but will be classified later on.